I’ve been dying to make this for like … six months now. SIX MONTHS! I can’t decide it that means I’m ridiculously patient, or ridiculously lazy — it took me so long to make something so simple. Hmph. I’ll go with “ridiculously patient” for 500, please. Remember back in May, or April, when I went to that food conference and met Megan and Cindy and had a freaking amazing time all weekend? Yeah, me too. That was fun. ANYWAYS. Right after taking this picture, we all enjoyed dinner at Clyde Common with Tillamook — who you KNOW I love. 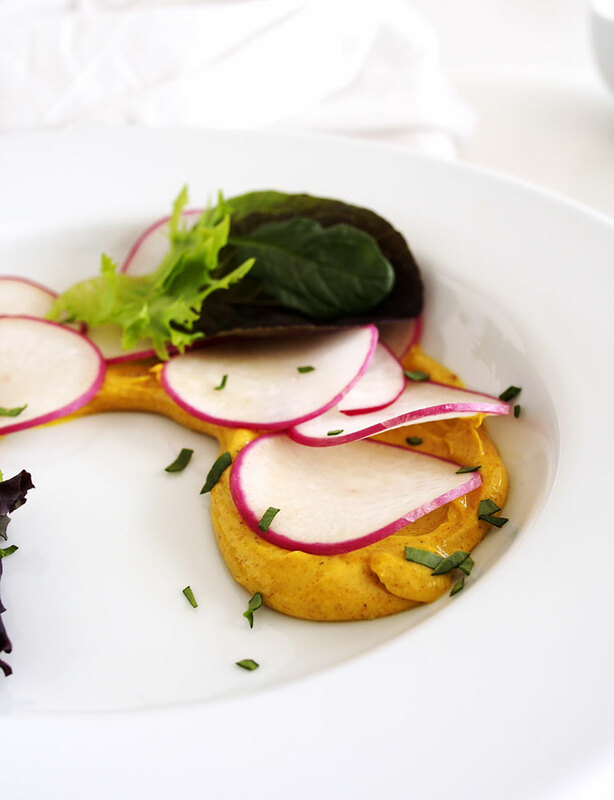 One of the first dishes was something along these lines — curried butter topped with errrrmazing radishes and greens and OMG I was shocked/not at all shocked that I LOVED it. Loved it. And had to recreate it … six months later. So, here we are! It’s easy. 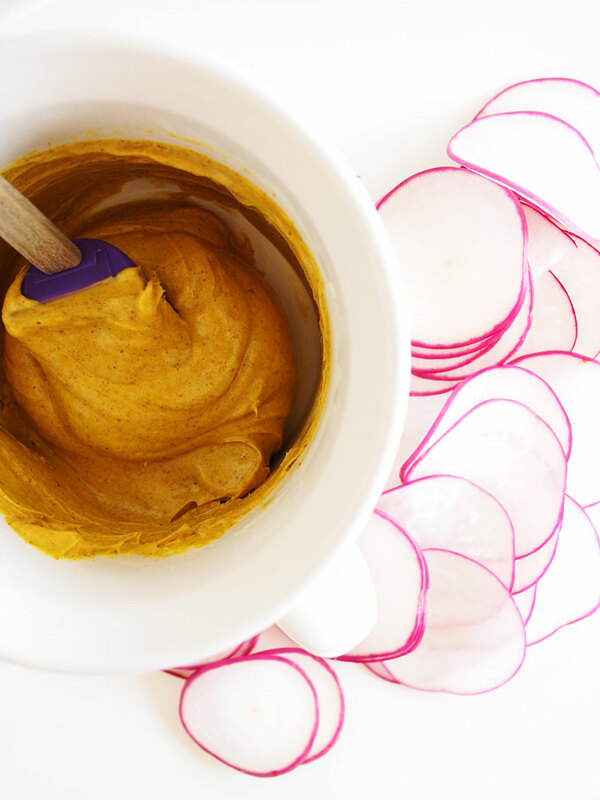 Get your butter semi-melty, mix in some curry and turmeric (I wanted it EXTRA turmericky … is that a word? No. Def not. 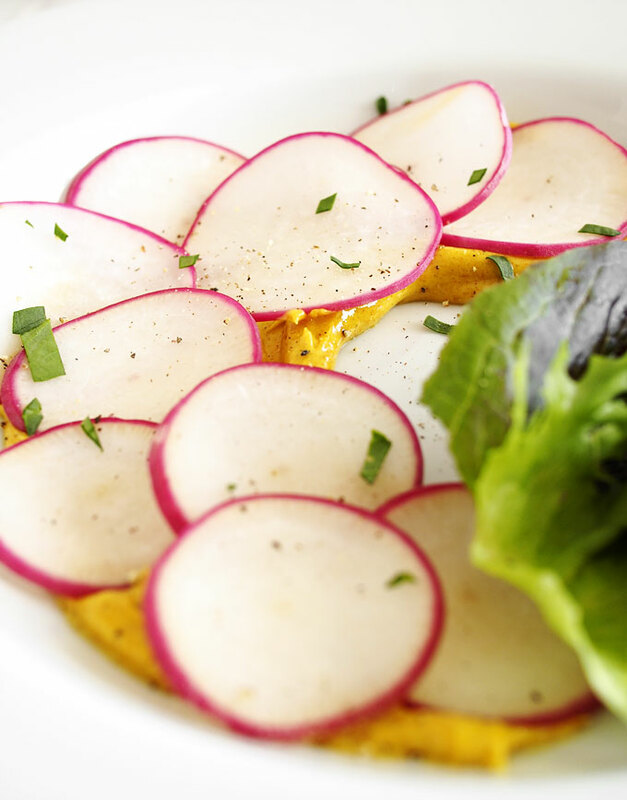 ), spread it on a plate all fancy-like, and top it with fresh delicious radishes from your Mom’s garden! Or the store. I don’t discriminate against any radishes. JUST GET SOME! Let the butter come to room temperature, then place it in a microwave-safe bowl and microwave for 10 seconds. You want to be able to mix it, so it’s totally creamy, without it being fully melted and liquid. 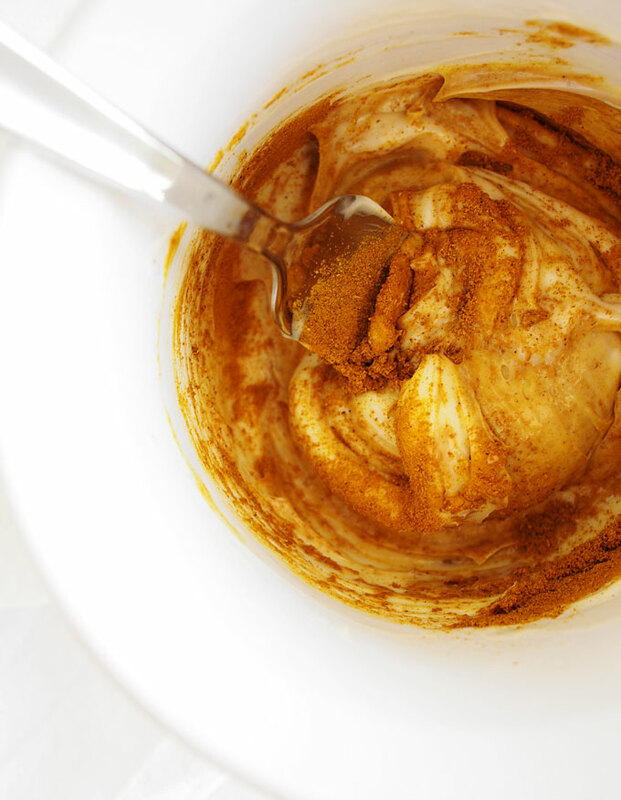 Once the butter is soft and smooth, whisk in the curry and turmeric. 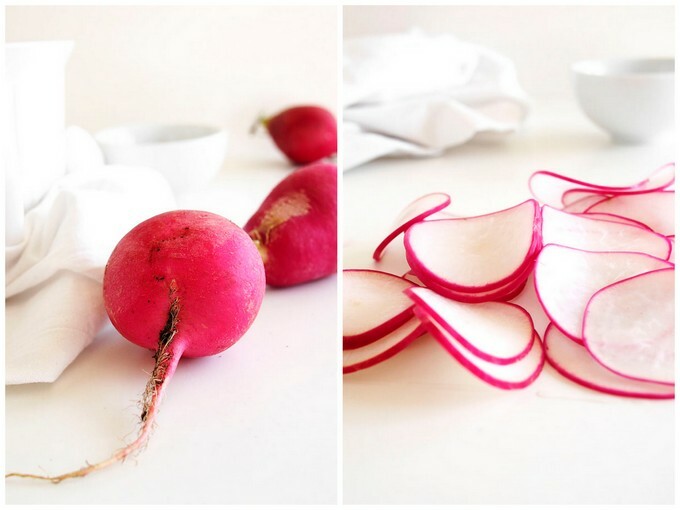 Slice the radishes as thinly as you can. 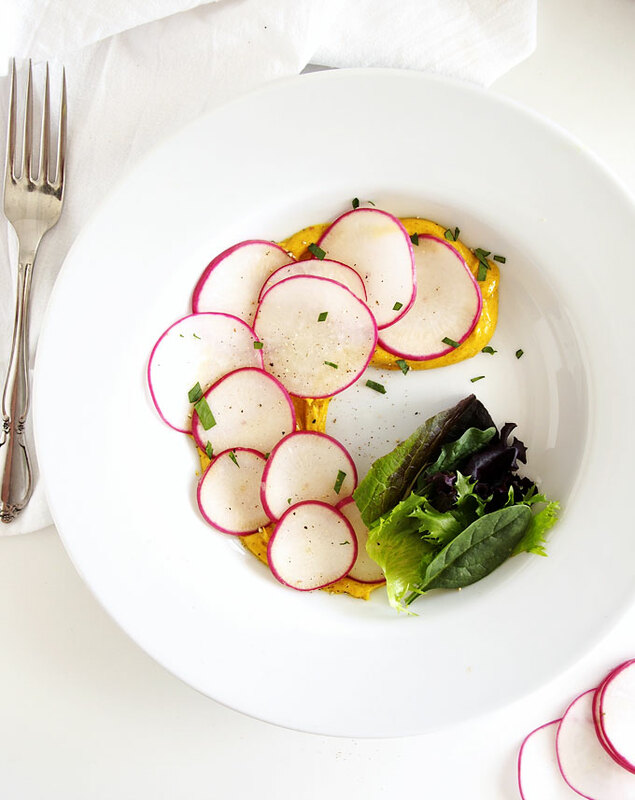 Spread the butter on a plate, top with the radishes and greens, and enjoy!